Meeting in Selsdon Wood car park, Old Farleigh Road, at time shown. Why not join us for about 2 hours? 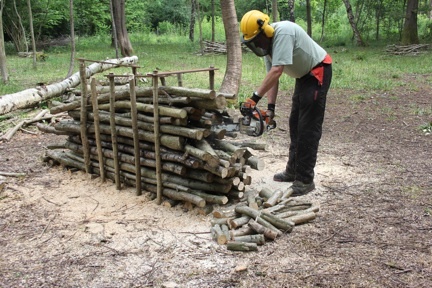 Habitat management and general maintenance – helping to improve our wood! You work for as long as suits you and choose jobs to suit your strengths. Tools are provided but please bring food and drink if you feel you need them. We do need more help and would welcome your assistance. 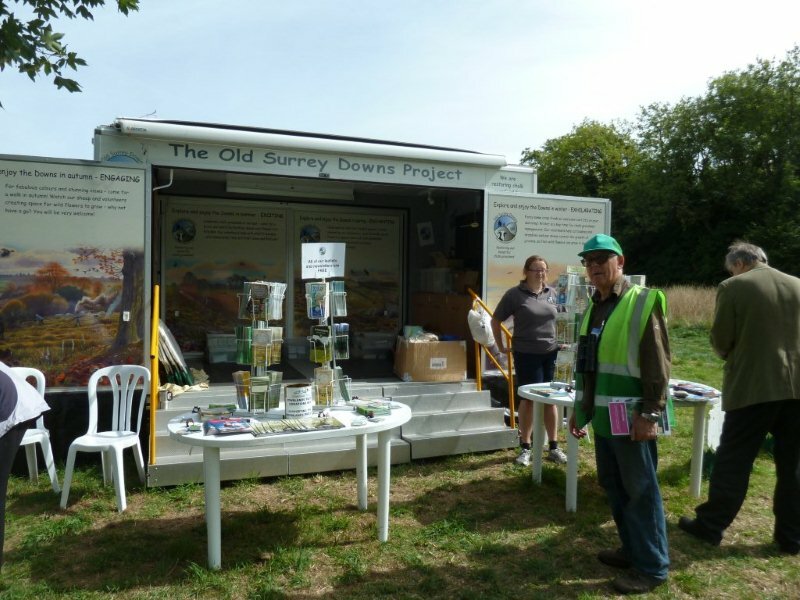 Meeting in Selsdon Wood car park on Sundays at 10am. January 6th & 27th, February 3rd & 24th, March 3rd and 31st, April 7th, May 5th, June 2nd, July 7th, August 4th, September 29th, October 6th and 27th, November 3rd and 24th, December 1st. All are welcome to come along – we would value your opinion. 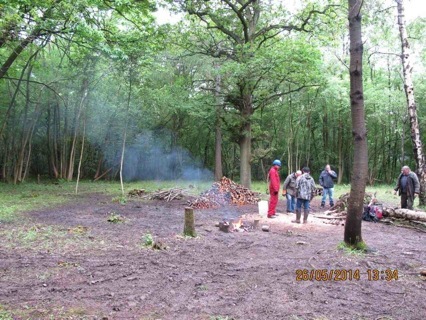 If you are interested in the future of Selsdon Wood, we need your views. All meetings start promptly at 8pm at The Forum, Forestdale. 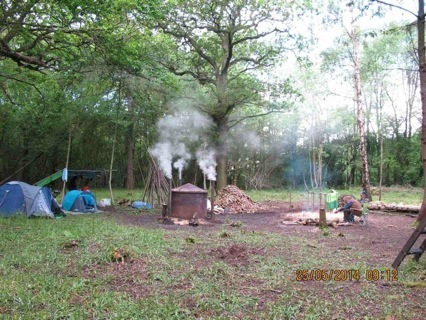 The FSW were approached in January 2019 by Paul Burns, Group Scout Leader, to tell us that the Scout groups would like to do a litter pick in our wood on 2nd February. We were delighted to be involved and we advised them that the area of Court Wood adjacent to Courtwood Lane would be the best location as the litter has been building up there over this winter, worsened by the fact that for some reason the Council have removed the bin by the bus stop. 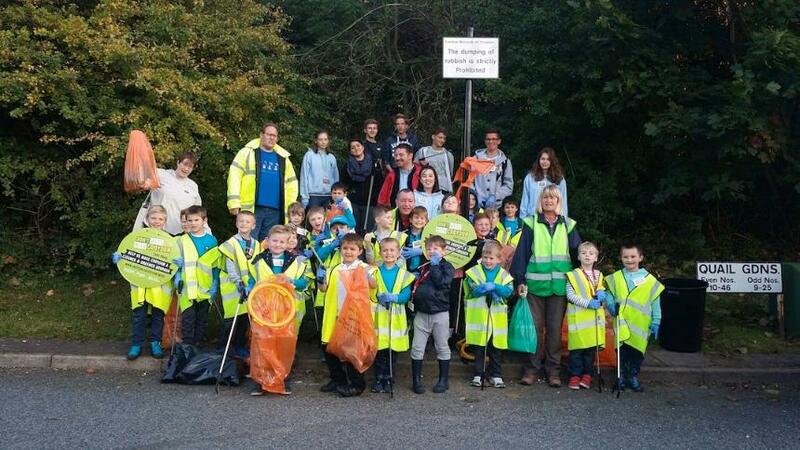 The last litter pick in this area was carried out in 2015 - also by local scout groups (see below). 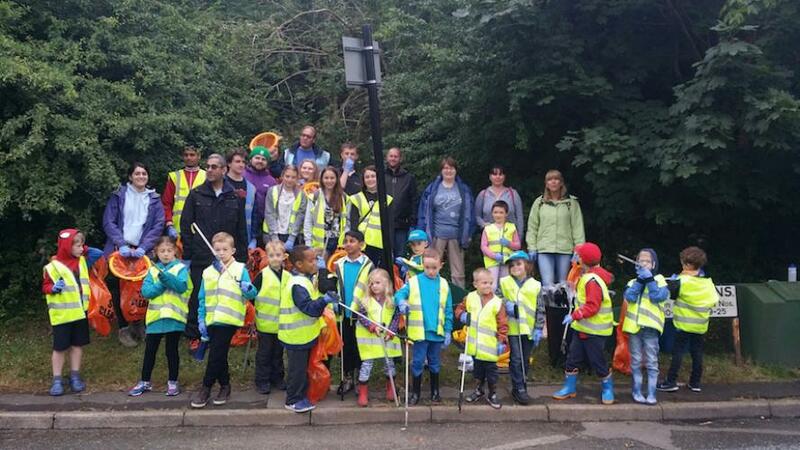 Tracey Bellamy confirmed that the Council Clean and Green team would be able to support the activity by providing orange collecting bags, hi-viz jackets, gloves and litter pickers. All the volunteers and the Council team met at 10am beside the wood and, suitably equipped, the volunteers worked tirelessly for an hour and a half in cold weather with some lying snow. By 11.30 we had collected around 20 bags of rubbish - see photo. The Croydon team returned to collect their kit and the rubbish was left by the roadside from where it was collected by Veolia (Croydon's waste disposal contractor). 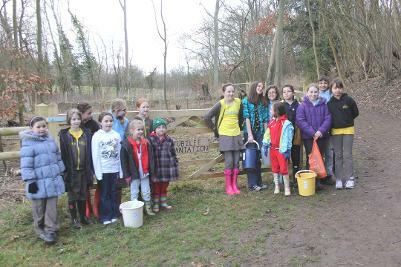 The photo shows some of the cubs, scouts and families who helped. 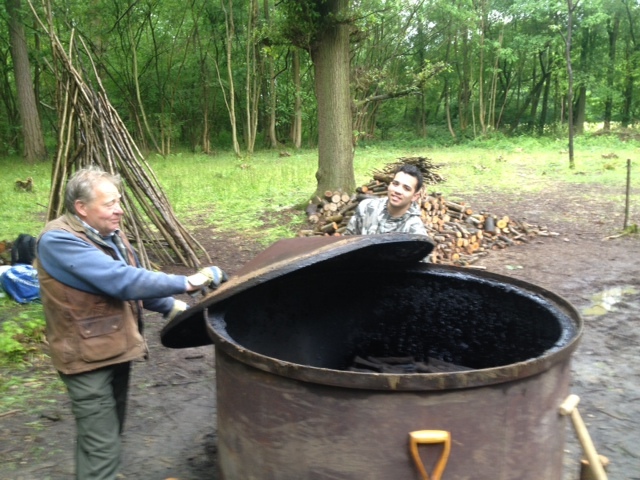 Around a dozen youngsters turned up to help although most of them had left before the photo was taken. 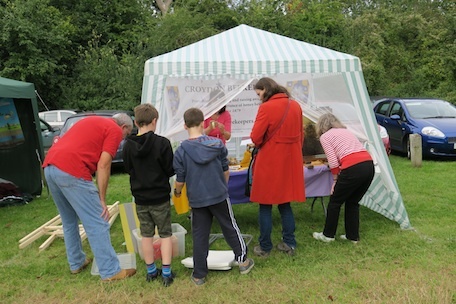 With favourable weather conditions attendance at this year's Open Day was good and steady over the full 4 hours. These are the reports from the various FSW stands/activities. So a very successful day. 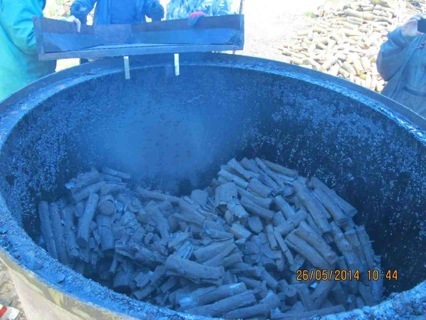 Recruitment Report from David Malins. 1 new member subject to submitting standing order. £160 cash on the day. My grateful thanks to my team – Christian, Linda Lee, Liz Phillips. The results were helped by the Scavenger Hunt team pointing parents in our direction. Cash prizes were donated by an anonymous benefactor - to whom sincere thanks! 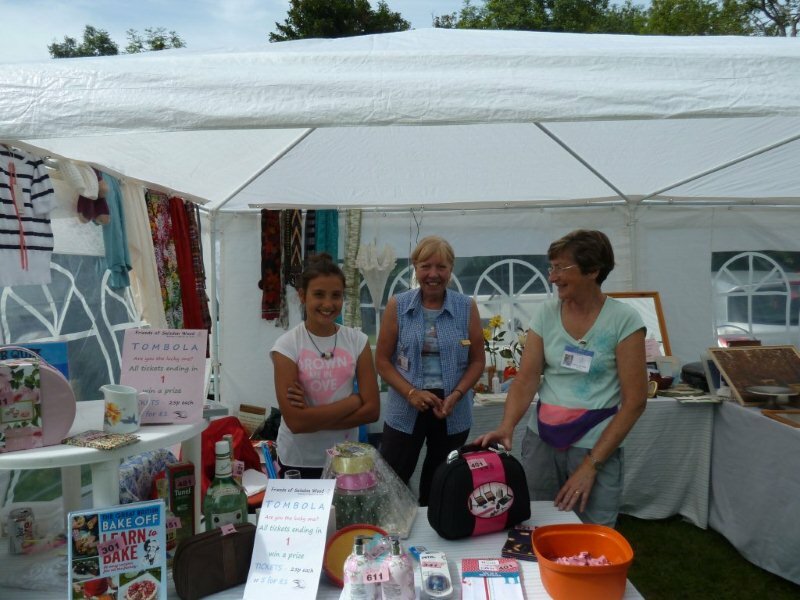 (Both of the 3rd prize winners donated their prizes to the FSW.) 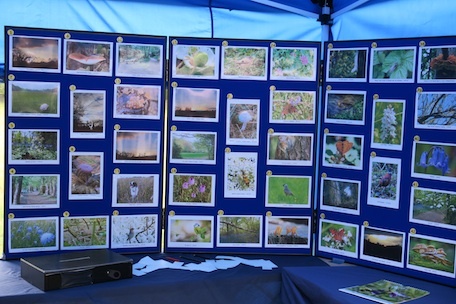 All the winning and shortlisted photos are shown on the Photo Competition page. I led two walks following the same route through Greenhill way, Vincent Avenue, David’s Crook, Linden Glade, Smith Grove, Gt Field and back to the car park. 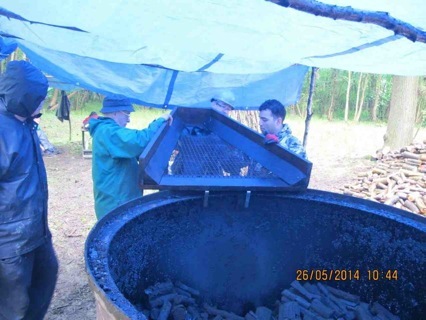 The first group had 22 people including three young children. The second group began with three, picked up a fourth then were joined by three others – a father and very young daughter got as far as the bottom of Vincent Avenue before deciding to return to sand art! 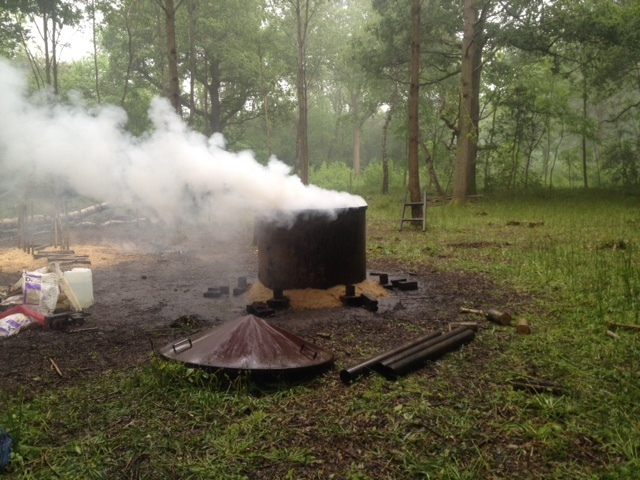 I mentioned our recent activities involving tracing the route of the water supply to Linden Glade and Tony’s checking that it worked. With the first group in David’s Crook I noticed two white blobs poking out from under a leaf and on turning the leaf over I exposed a resting Small Emerald moth which walked about on my hand for a few seconds before flying off, then in Linden Glade we saw an active Speckled Wood butterfly. With the second group I mentioned the possible activities of Brown Hairstreak, Purple Hairstreak and White Letter Hairstreak butterflies on Blackthorn, Oak and Elm respectively and pointed out the sloes on Blackthorn. At the non-functioning water fountain I mentioned Cyril’s comment about it originally being in the field whereas it is now hidden behind a wall of Blackthorn. During the week I had seen many Collared Parachute fungi in Pool Grove but could not find any on the walk until a lady with sharp eyes found a few still surviving. In Linden Glade the focus of attention was obviously our problems with the cracked concrete liner but I did point out the large crop of berries (green) on the female Holly. We then followed our return route, looking at the Sessile-, Pedunculate- and Turkey Oaks as we passed the Centenary Plantation. With the smaller group we diverted along to the Jubilee Plantation to look over the fence at the pond before continuing back to the car park. Several people had never been in the wood before or had only come in with sleds when snow was on the ground and some seemed to be determined to return. 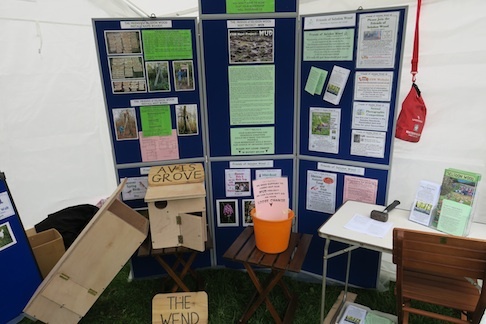 I reminded them that we run guided walks throughout the year, with the fungus walk being in October, and that they could always get information about our programme on the website. We used up “prizes” from last year so no expenditure there. Karen and I bought the sweets and crisps and all leftovers we have taken home with us. Although we did not count the numbers I estimate thirty to forty children took part in the scavenger hunt. We were very generous with prizes and sweets, some children took more than one of each. I think everyone enjoyed themselves in the lovely weather we had. Virgin Money donated beach balls and colouring books which we gave out as well until they ran out. Disappointing weather meant that attendance was low this year. 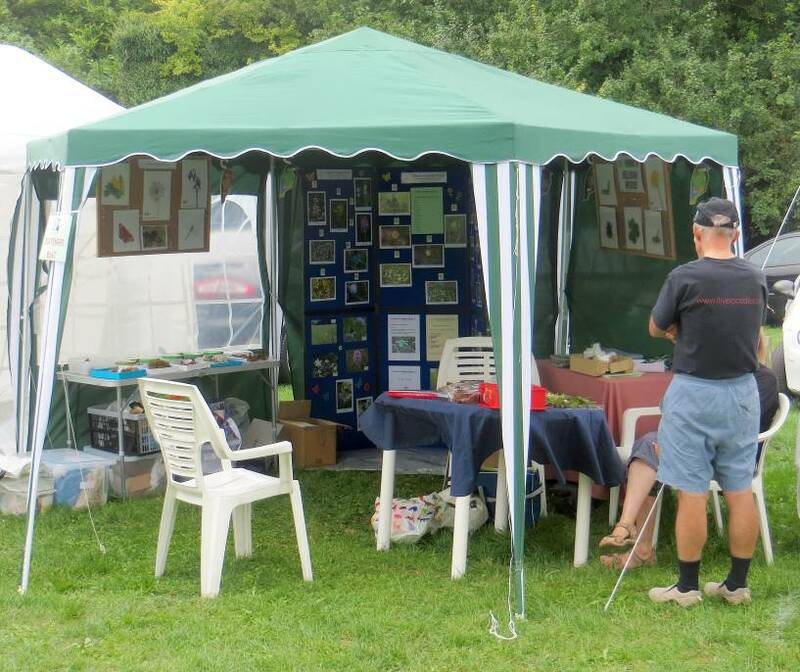 However we did manage to get things cleared away before the worst of the rain came and none of the gazebos actually took off in the gusty wind. 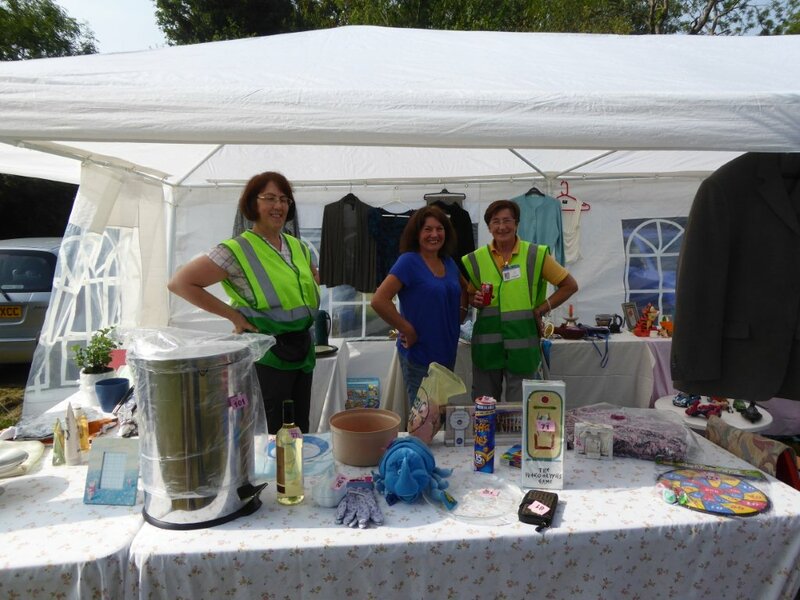 David, John and Miss M. Whillier manned the recruitment tent, Linda, Tony & Sandra the tombola stand, Heather the photo competition & calendar sales and Neale, Karen & Sarah Malins the kids tent & scavenger hunt. 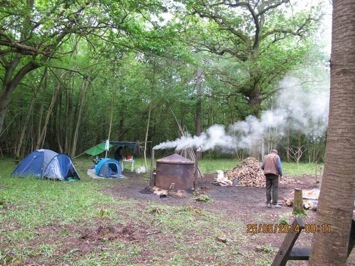 Ted led two walks, Sarah read story time for the children and, as usual, refreshments were provided by the Scouts. 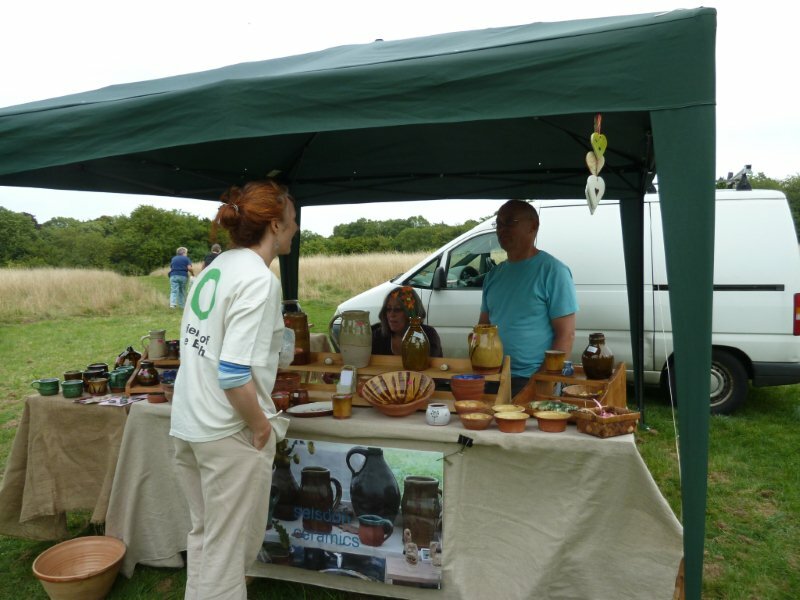 Guest stalls included: Badger Protection Society, Friends of the Earth, Beekeepers, Woodturners, RSPB, Sand Art, Friends of Littleheath Woods, Uncle Ria's Jams, SRA. We had a slow start due to the slightly unpredictable weather. However things did pick up and although exact numbers were not recorded I would say twenty five to thirty children participated in the scavenger hunt. Mostly younger children took part and some joined Ted on walks as well as Sarah reading stories. Most children took their finds home in little bags we provided and were proud of their efforts. We have lots of toys for next year left over. The leftover crisps and sweets can be consumed by workday participants or given away on walks. I waited for the first walk to start at 12.30pm but there were no customers. After waiting until 12.40pm I noticed a lady emerging from the toilet with her 3 year old grand-daughter and carrying a scavenger sheet. I asked if they would like me to show them around. Young Abigail did not stop talking during the walk. I took them up Greenhill Way and down into David's Crook where we found most of the items on the sheet but could not find any Hazel nuts. While we were walking through the path towards Stevens Walk granny suddenly bent down and picked up a conifer cone, then a few metres further on she picked up a Hazel nut. At the second walk at 2.30pm there were five adults one of whom said she had lived in the area most of her life but would not walk in the woods on her own and did not know where the pond was. I took them through David's Crook, pointing out sessile Oak and Turkey Oak next to each other, then on the way back later we were able to see the pedunculate or English Oak by the Centenary Plantation - sporting a fine crop of Knopper Galls and a few good acorns. I pointed out the crop of sloes, obviously mentioned sloe gin, and talked about Brown Hairstreaks and Blackthorns. We reached the pond in Linden Glade where I showed them our "henge" and the cracks in the concrete liner. Return was via Smith Grove and The Wend , where they were intrigued by the Common Earthballs, then past the Centenary and back to the gazebos. Both groups seemed to enjoy themselves. All the winners and other shortlisted photographs are shown on the Photo Competition page of this website. 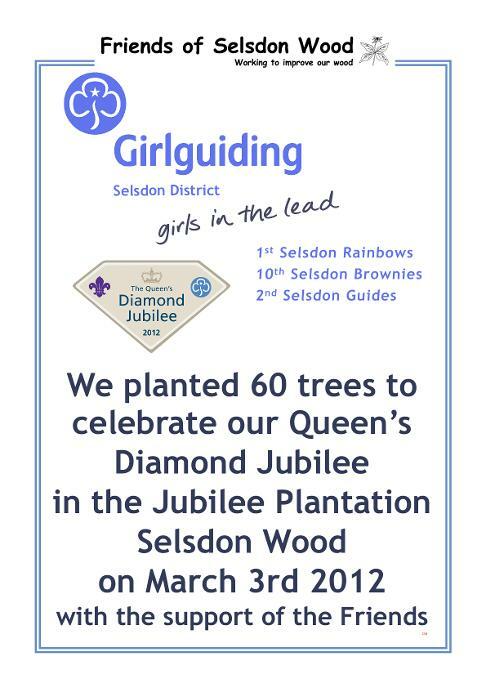 After the successful litter pick with the Beaver Scouts 2 years ago, we were approached this April by Diana Walters leader of the 5th Selsdon & Addington group to organise another similar event this year. 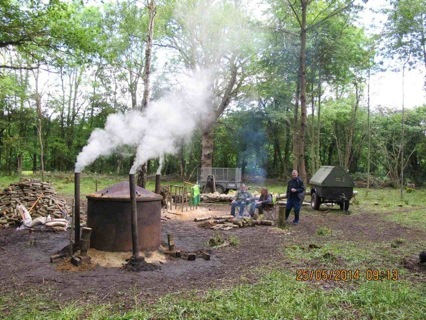 The Council Clean & Green team were happy to participate again and so the FSW investigated appropriate sites. Fox Shaw had been well cleared on the previous occasion so this time we focused on the adjoining paths. There was a big buildup of litter at the end of Yew Tree way where youths had been gathering to party and along the stretch of the London Loop and Vanguard Way running along footpath 515. In the other direction, the footpaths running alongside Fox Shaw to Kittiwake and Turnestone Closes also needed attention. Around 15 Beaver Scouts supported by teenage Explorer Scouts and half a dozen leaders and parents assembled in Quail Gardens by the footpath to Selsdon Wood at 6pm. 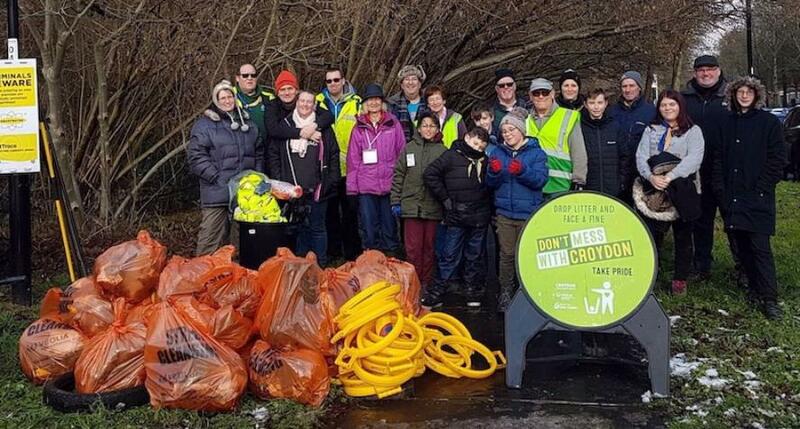 The Croydon Clean and Green team handed out lots of litter-pickers, collecting bags and gloves and hi-viz jackets for the children to wear. 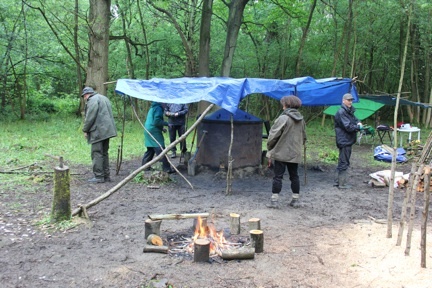 We split into 2 groups – one going into the wood and along Vale Border in the direction of Yew Tree Way and the other following the footpaths at the edge of Fox Shaw towards Kingfisher Gardens. After an hour of litter picking we had a substantial pile of rubbish including a car wheel, part of a motorbike tank and a 2m long piece of insulated cladding. As parents came to collect their children we gave ourselves a round of applause and we all went our separate ways at 7pm after a very fruitful hour. 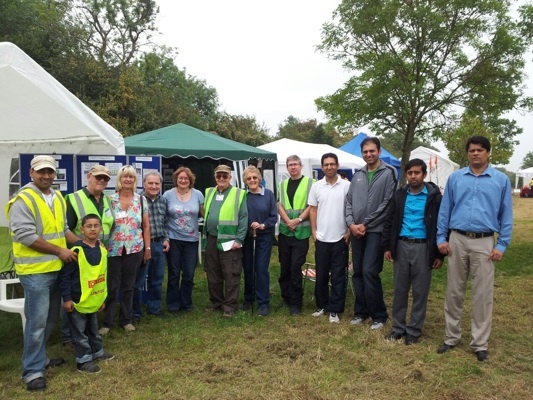 The Croydon Clean & Green Team took all the rubbish away. 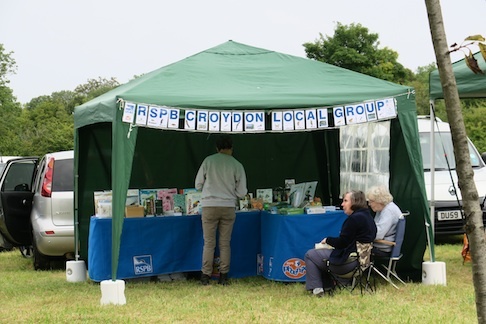 A big thank you to Diana Walters and the 5th Selsdon and Addington Beavers group and to Tracey Bellamy and the Croydon Clean and Green Team for all their support. 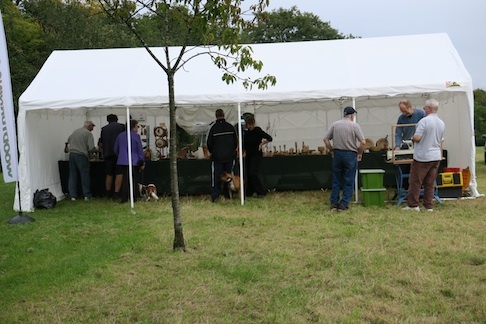 We had a beautiful day for it thus year, the attendance was steady throughout the 4 hours and a good time was had by all. 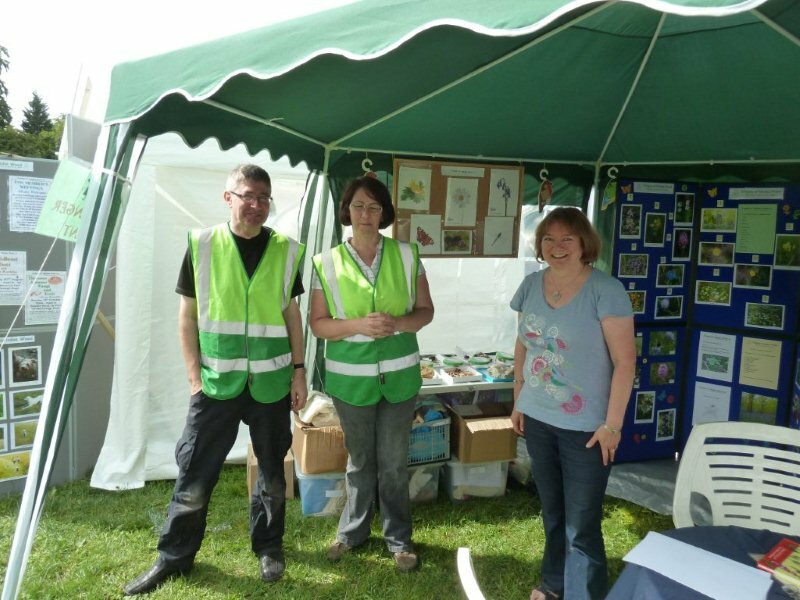 David, Janet and John manned the recruitment tent, Linda, Tony, Sandra and others the tombola stand and Neale and Karen the Scavenger Hunt stall. 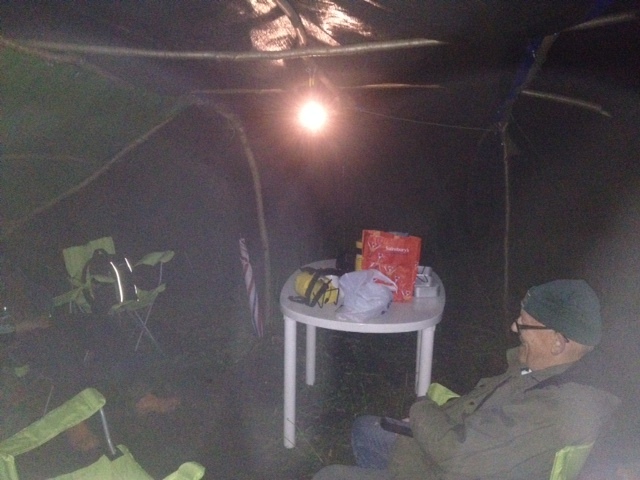 Ted led two walks, Sandra read story time for the children and, as usual, refreshments were provided by the Scouts. 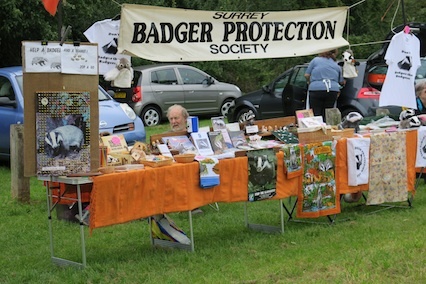 Guest stalls included: Badger Protection Society, Friends of the Earth, Beekeepers, Woodturners, RSPB, Selsdon Ceramics, Friends of Littleheath Woods, Epilepsy Society, Vegans, Uncle Ria's Jams, SRA, and Mrs Jess Bates with her ferret. The first walk involved a dozen people including several youngsters who were looking for Scavenger Hunt items based on sheets prepared by Heather last year. 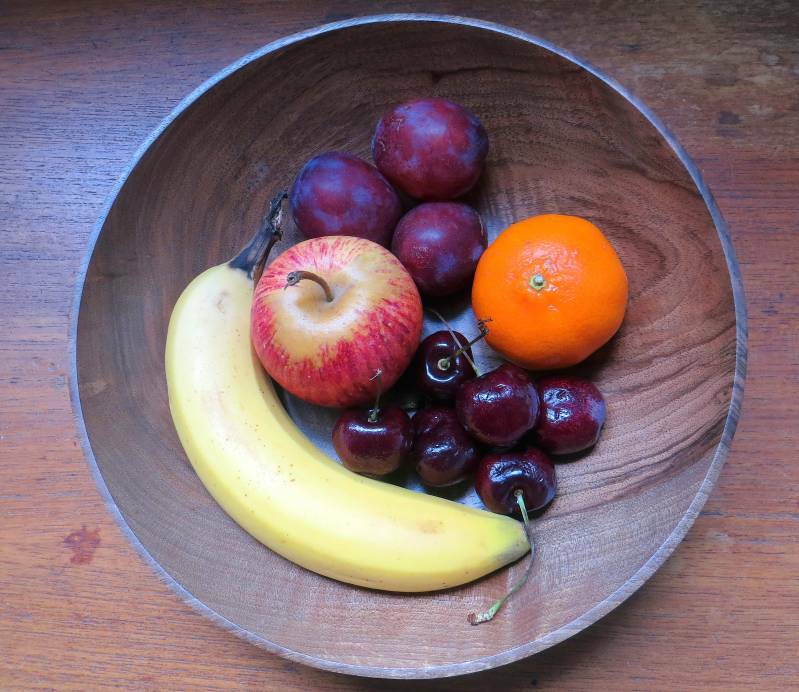 Our first item was “a leaf with spots”, i.e. Sycamore leaf showing Tar Spot. Where normally at this time of the year we would expect to find all Sycamore leaves covered in black blotches we saw that most leaves were untouched by the fungus. Keeping an eye open for other items, we walked through David’s Crook to Linden Glade where we looked at a well-grown Beefsteak fungus. Returning via Smith Grove we found another Beefsteak at the junction with Bluebell Grove. Following Bluebell Grove to The Wend we were able to see the collection of Common Earthballs. 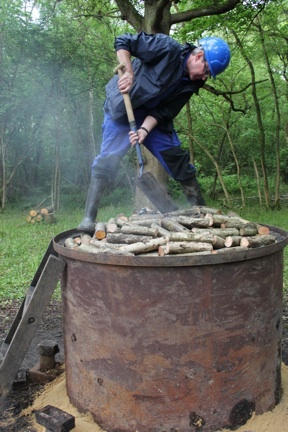 The last task was to find a Hornbeam which we did in Field 3. We finished the walk in one and a half hours. The later walk had no Scavenger Hunters and had ten adults. 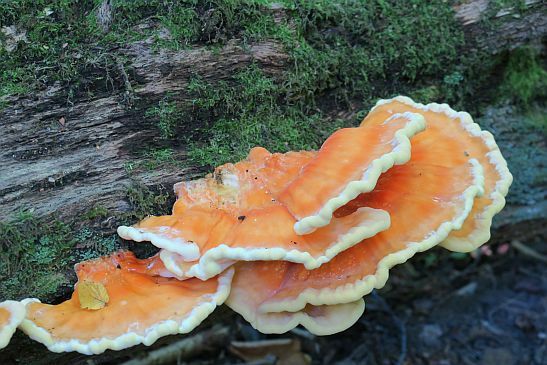 We followed the same route but in Linden Glade, after admiring the large Beefsteak, someone spotted a bright yellow fungus further into the wood. It proved to be a group of Chicken of the Woods in marvellous condition spread along a fallen log. When I remarked that I usually saw them in a tier of brackets my attention was drawn to a nearby tree which had just such a tier protruding from the trunk. On the way back we investigated differences between Common Hawthorn and Midland Thorn, and also compared Sessile-, Pedunculate- (English), and Turkey Oaks. We were back at the car park in less than an hour. 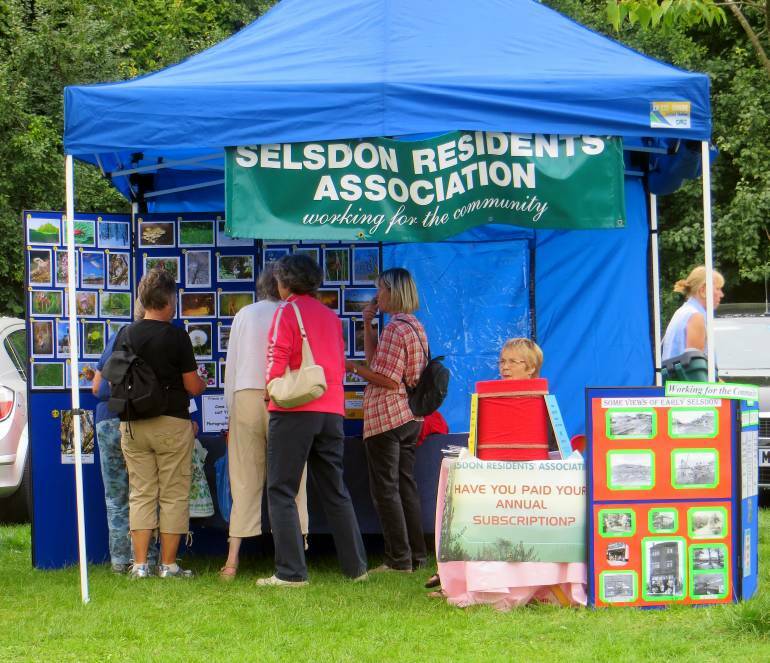 This event was held to celebrate 90 Years of the Selsdon Residents Association and 80 years since Selsdon Wood became National Trust property. It was a Big Lunch BYO picnic with support from the Scouts who ran a refreshement tent serving burgers, cakes and hot and cold drinks. 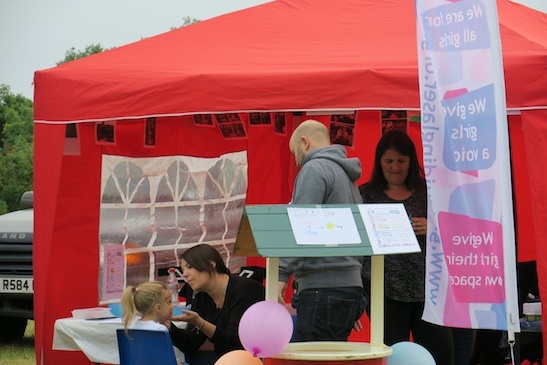 The weather did us proud and the event was much enjoyed by groups of families and friends. 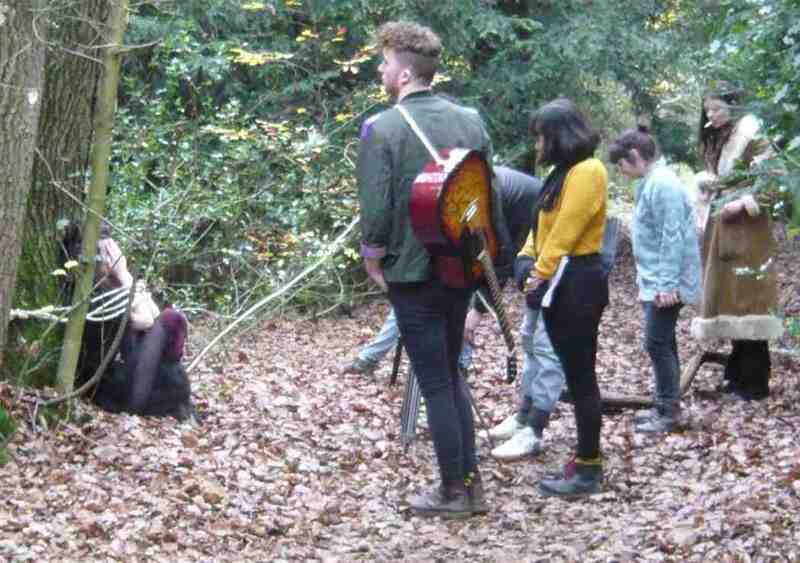 In November our wood had a visit form a group of students in Filmmaking, at Kingston University. 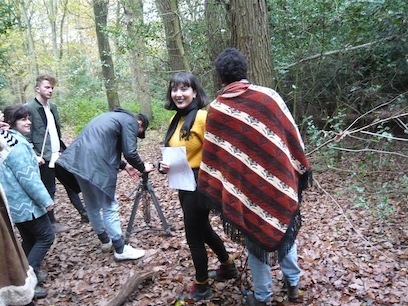 They were led by Jade Lederer who was shooting an adaptation of "The Wonderful Musician", a Grimm's fairytale as part of her assessed coursework. We gave her and her art director a tour of the wood looking for suitable locations and after they had cleared everything with the Council they came to film on 9th and 11th of November. The weather was kind to them on both days and I saw them shooting by one of our significant landmarks (see right) at the junction of Bluebell Grove and The Wend on Monday and near the Monster Trees in Beech Grove on Wednesday (see below). We are told that the film will be available on the web in due course and we shall be sure to let you know when it appears. Around 25 Beaver Scouts supported by 8 teenage Explorer Scouts and half a dozen leaders and parents assembled in Quail Gardens by the footpath to Selsdon Wood at 5.30pm on Wednesday 30th September. The objective was a litter pick in Fox Shaw and also along a stretch of the London Loop and Vanguard Way running along footpath 515. 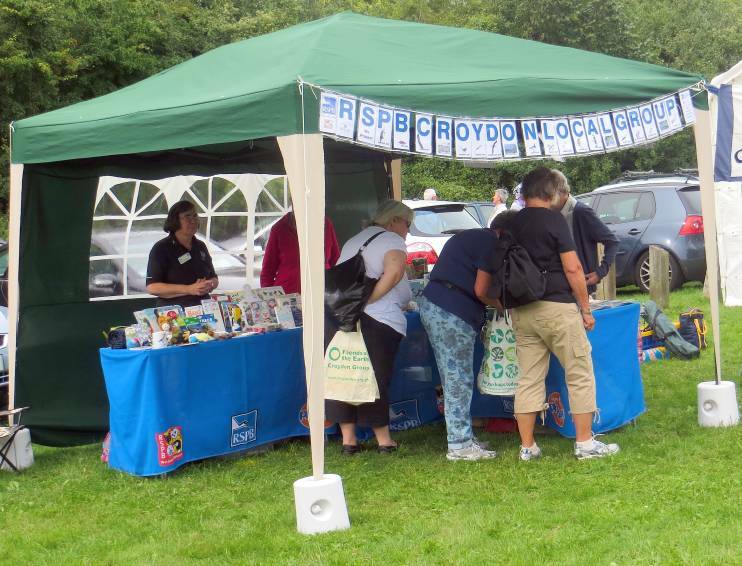 The Croydon Clean and Green team handed out lots of litter-pickers, collecting bags and gloves and hi-viz jackets for the children to wear. 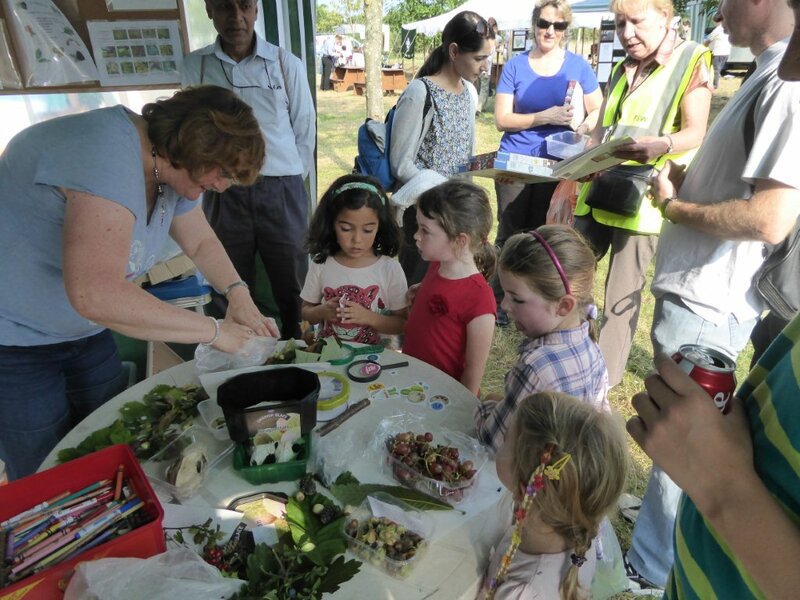 All the children were also fitted with Fantastic Foxes badges (see right). After about 30 minutes of successful litter hunting in Fox Shaw we regrouped (see the photo below) and walked into the wood and along Vale Border in the direction of Yew Tree Way. 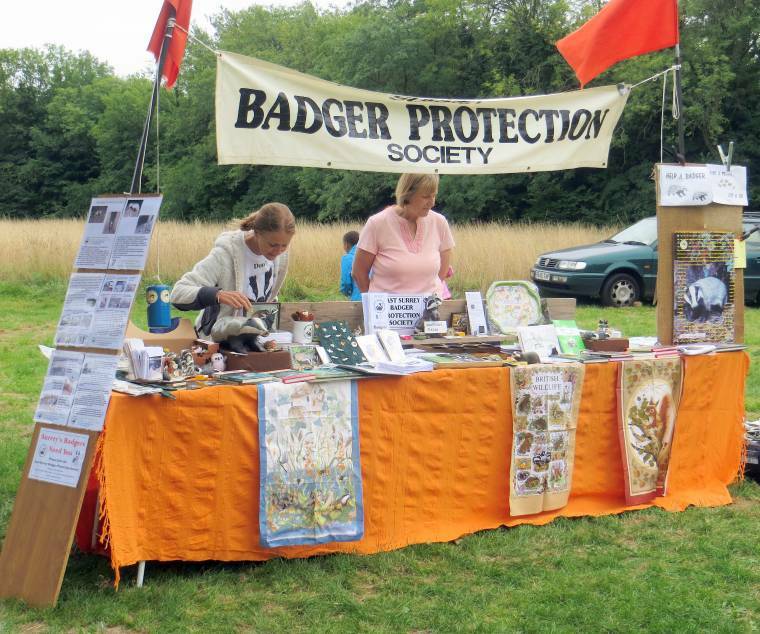 We stopped by the badger setts and fox holes where the lovely picture of a baby fox used on our badge was taken (by FSW member and Photo Competition regular Sheila Woolcock in the spring of this year). 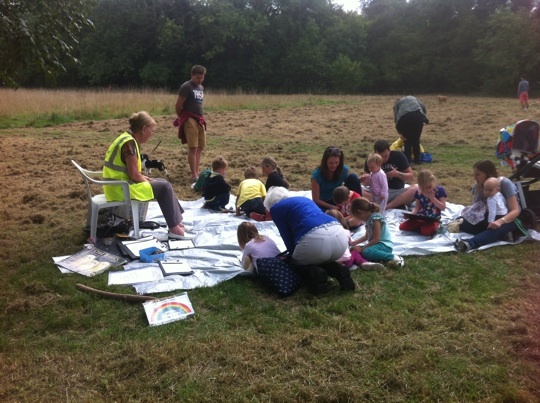 We showed the children the full photograph and explained where it was taken and pointed out the badger diggings. 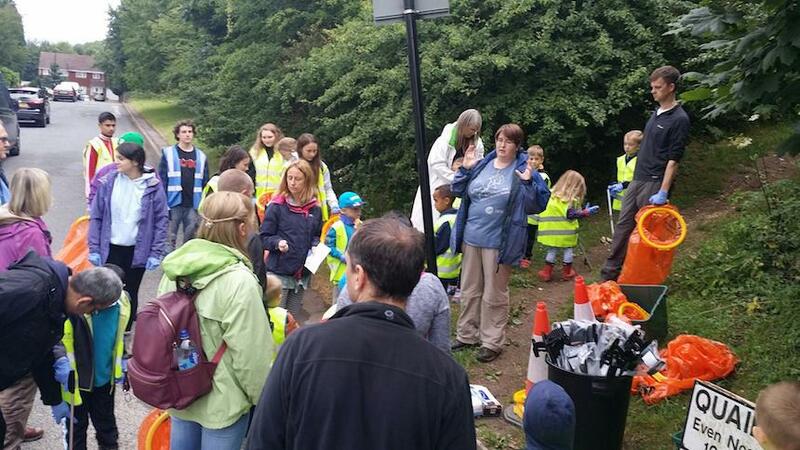 We then walked along the London Loop footpath to Goldfinch Road picking up a huge amount of litter along the way. We pretty much managed to fill the Council van with the results of our work and all went our separate ways at 6.30pm after a very fruitful hour. 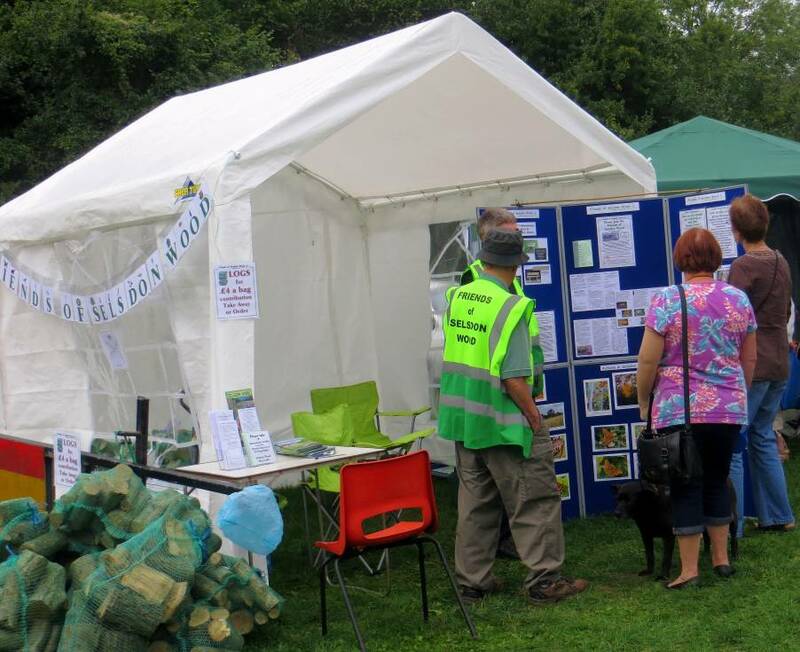 A big thanks you to Diana Walters and the 5th Selsdon and Addington Beavers group and to Tracey Bellamy and the Croydon Clean and Green Team for all their support. Having watched weather forecasts slowly improving over the last days and even hours before Sunday’s opening, it was with some optimism that I got to the car park at 8.30am. I opened up the toilet block and the gates to the extension car park then checked Linda’s marking out of the various stalls. 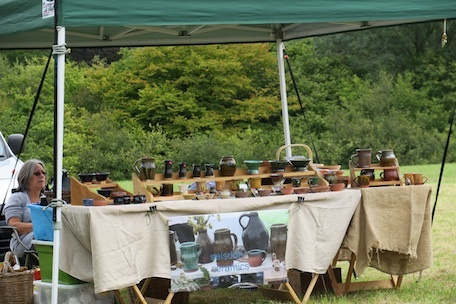 Over the next half an hour most of the FSW Committee arrived with husbands, daughters and granddaughters in tow, joined by Richard Lock, Simon Morris and Joseph Stone, and later one or two others who would help on the stalls. 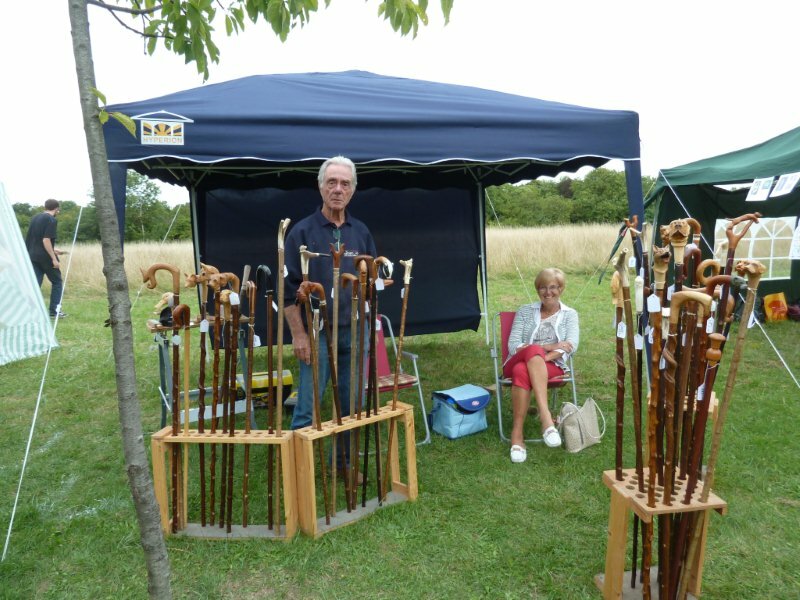 Our trolley, with its colourful new wheels, was in use to ferry gazebos and other heavy items from the toolstore and, as the gazebos rose in their positions, a constant stream of materials came from cars and store. 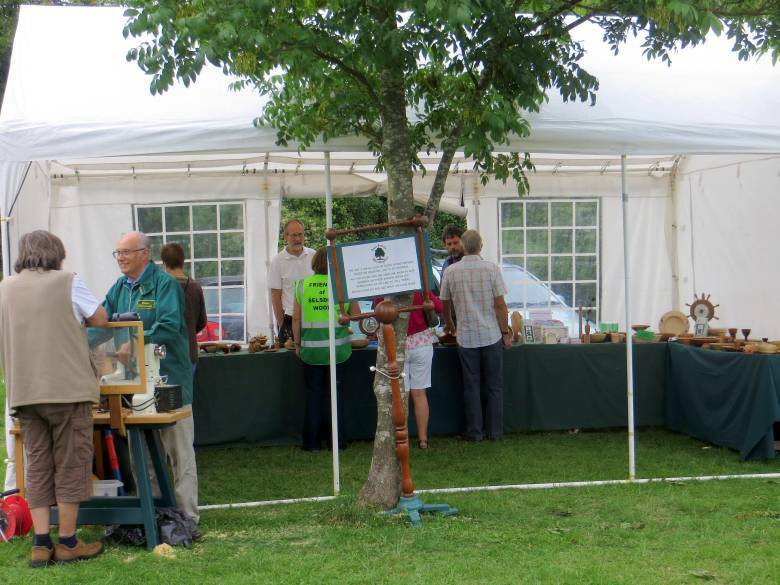 I helped David erect his impressive display of the work we do in the wood (see right) then directed the various stall holders to their places. 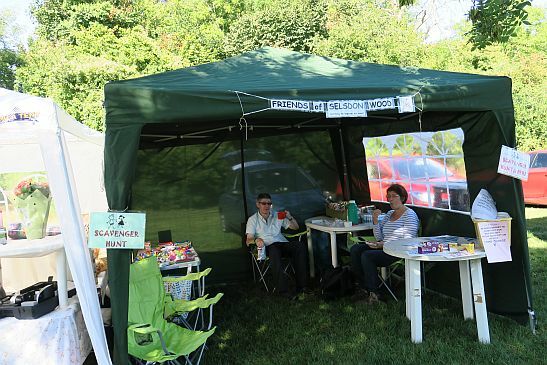 The woodworking group alone had seven cars, all of which we were able to retain behind their marquee, as we did with all the other stall holders vehicles. This helped to give an impression of a much bigger event and was only possible because the grass cutting had been so well done this year. 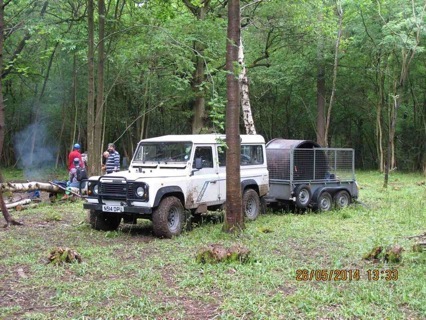 I was given the notice indicating where to meet for the walks and was about to attach it to the bear when I saw that the refreshment vehicle was stuck behind the entrance barrier which was still closed as I had not expected a high vehicle. I soon managed to open that then got back to the bear only to discover that the string had been cut last year and no longer fitted round the bear. That was sorted out by attaching a longer piece (and at the end of the day it was removed without cutting!). When I pay for items using cash I frequently get a handful of 1p, 2p and 5p as change and usually throw them into a container in a drawer. I had no idea what I intended to do with them eventually but decided to spread them around the collection buckets so that we began with something in the buckets to encourage others to donate. By now it was getting close to the first walk so I wandered over to the bear and was joined by a lady who said she walked in the fields but did not like to walk in the woods unaccompanied. The group was completed by the addition of a couple and we set off up Greenhill Way, chatting about anything which came to mind, including some of the items for the children’s scavenger hunt. We had a good look at Ash keys and discussed the fruits of Sycamores and Maples, then I began pointing out fungi. They must have been paying attention for one of them pointed out a large number of fungi (Inkcaps) growing on branches off the path just before we turned towards David’s Path. One of the ladies was Italian and we talked about the effect of continental immigrants, who know what they are doing, who pick fungi for consumption. Perhaps that is why I do not see some of the more interesting edible fungi – they have got there before me! 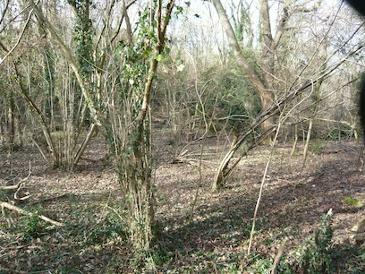 We followed an unplanned route through Pool Grove, Linden Glade, Leafy Grove (Yellow Stagshorn), The Wend (Common Earthballs), Smith Grove (Small Stagshorn), Great Field (Common and Turkey Oaks), past Centenary Plantation (where the Broad-leaved Helleborine has returned again and is now in seed) and back to the car park. The first lady had picked up a small map from David and I had a spare map I had printed out, which I gave to the couple, and at times we consulted the maps to show where we were. They seemed to enjoy the walk and I certainly did. It took just over one hour. 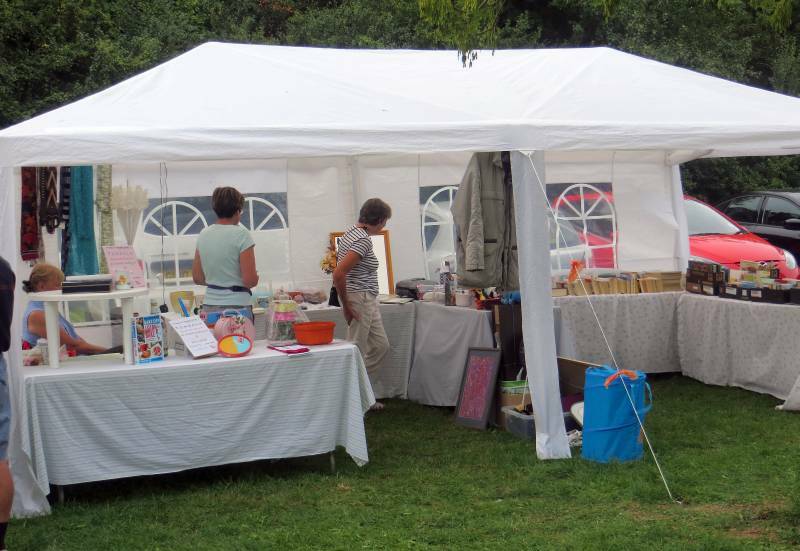 I took pictures of most of the stalls (see the gallery below) and was asked to supply a copy of the jam lady’s stall as she never had a picture of the completed stall (see right). 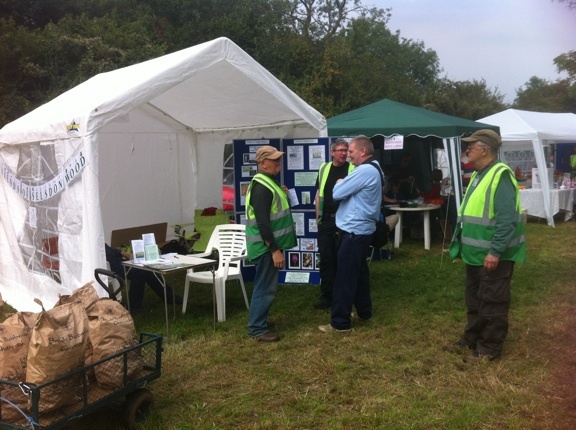 At the RSPB stall I was told that a large flock of House Martins had flown over earlier. There was a moment of panic around 2.10pm when I thought the next walk was to start at 2.00pm but a quick check confirmed 2.30pm. I discovered that Neale was encouraging any intending scavenger hunters to join in on the walk so instead of the three I had on the first walk I set off with at least 23. Neale had printed some of Heather’s scavenger sheets and backed them with a copy of the map, then laminated them in case we had rain. My morning route changed to bring in more of the desired items for the hunt so we were able to talk about Pedunculate-, Sessile- and Turkey Oaks and Knopper Galls, the new Shaggy Bracket fungus in Bluebell Grove, and the couple of dozen Common Earthballs. Again the walk was about one hour and everyone seemed happy. By now the main car park and the extension car park had filled up with cars. 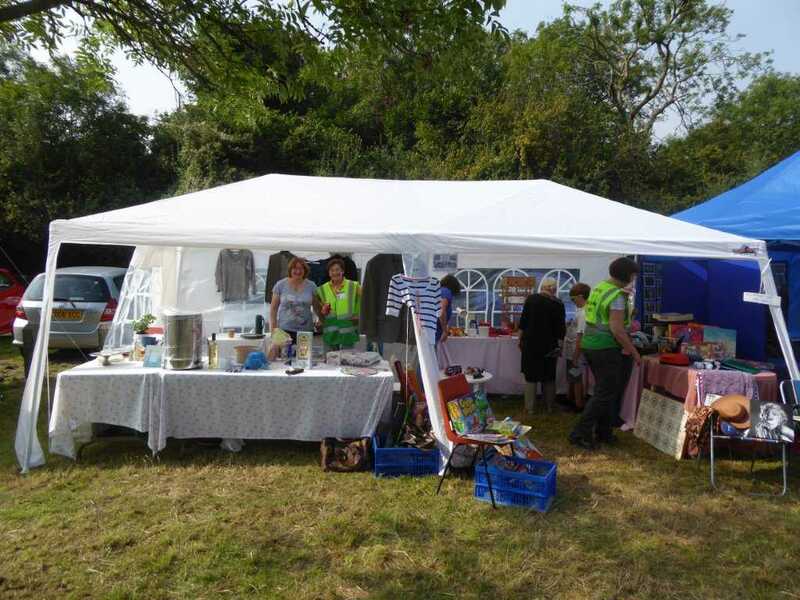 It was soon time to pack up and materials began drifting back to stores and cars, gazebos came down and were packed away, and visitors’ cars disappeared – except for one which was parked at the far end of the extension car park. When this happened on a previous occasion we left the gate between the car parks looking as though it was closed but put a message on the car windscreen as explanation. We considered doing the same but as we stood talking as the last car was filled with David’s display, etc, the owners of the vehicle arrived so we were able to close the gates, including the height barrier, and leave the site (at last!). 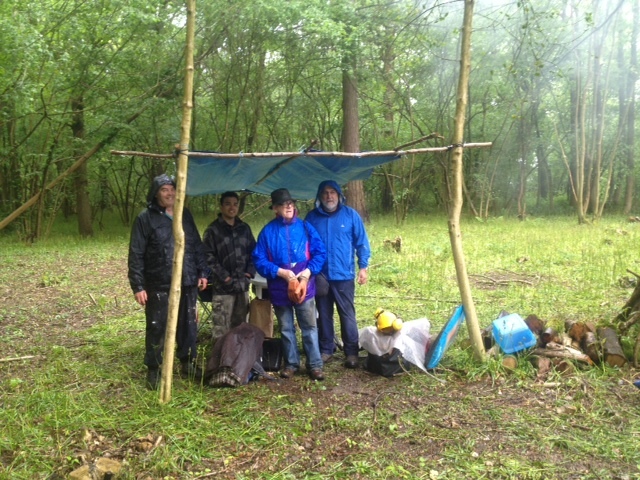 It had been a long day but the predicted rain had not appeared so we did not have the problem of dismantling gazebos in the rain and later having the problems of drying off wet ones. (As we waited at the end a very large flock of House Martins flew over as they hunted for insects over Vale Border). We enjoyed ourselves, it was fun and we did work together as a team. Neale went round and gathered troops for the story and the scavenger hunt, which was good for us. Once we got going we were joking with the kids and the parents. Some of the parents, when they knew it was free, wanted to donate something. We directed them to the collection bucket in the FSW gazebo. A separate bucket in the Kids area would be good in future. The parents were as enthusiastic as the kids and they were all so nice and very polite. They did put effort into it. The easier Scavenger Hunt sheet was better, the children were mostly 7/8 and below. However the other sheet was good in that it gave hints of where to find the items, so it was useful to have both. Lots of children didn't find pine cones, but then lots did. They kids liked the badges and Neale has recorded what prizes were most popular. It was a good idea to have samples of the items to be found, especially as I didn't know what sloe (is that how you spell it) was. 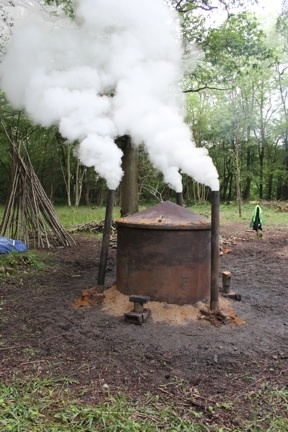 However all the adults seemed to know it was connected to gin! The children enjoyed looking at the skulls but there was no great interest in colouring activities - we just has 2 kids that coloured in. We did put some pictures in their bags. That was it. People were interested in maps of the wood and the leaflets. Sophie enjoyed talking to the kids and thought the kids liked adding their names to the list of participants that she maintained. She thought we should get their ages next time. I think there were over 40 names on the list. I think it went well and around 50 children were involved at one time or another. 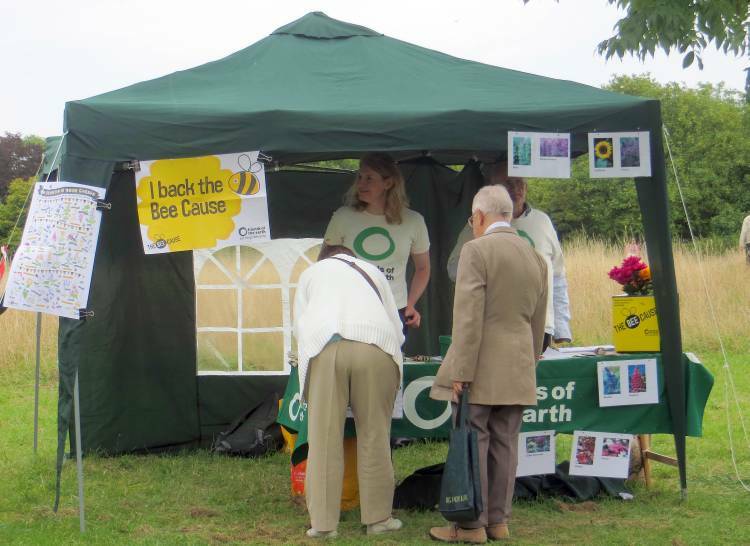 So we did very well - raising almost £600 to fund our work in the coming year. 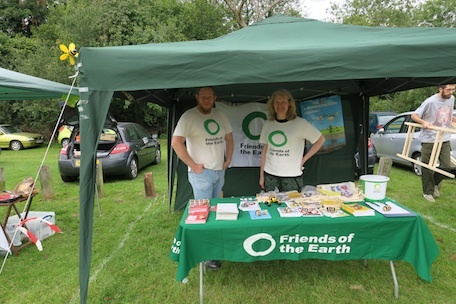 The FSW display and recruitment tent was organised by David Malins with the support of Janet, John and Ted. 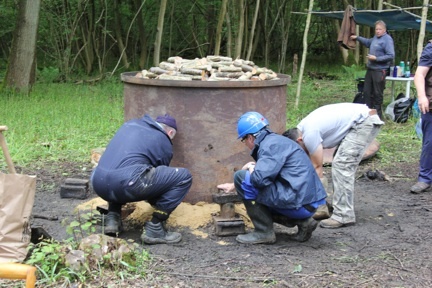 Subs were paid by 17 new members and 3 renewers (£95) and there were donations totalling £25. I was unable to attend Open Day this year and I would like to offer a personal thank you to everyone who made it so successful. 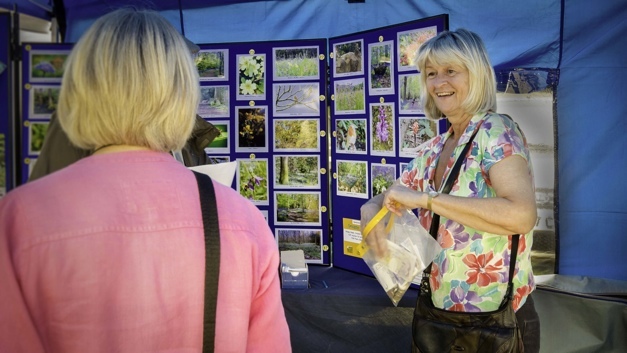 The main work of planning and preparation was all down to our secretary and Open Day Organiser, Linda Morris so we owe her a huge vote of thanks. Ted (see above) and all the rest of the FSW Committee - and members of their families - worked hard on the day and my thanks to each of them for their efforts. On behalf of the FSW, I should also like to say thank you for prizes and sweets donated by Snappy Snaps, Vintage 62, Clarks Newsagents and Friends. Thanks too to John Wren of Croydon Council for arranging for the grass cutting and subsequent clearing. Everyone commented on how well it all looked. 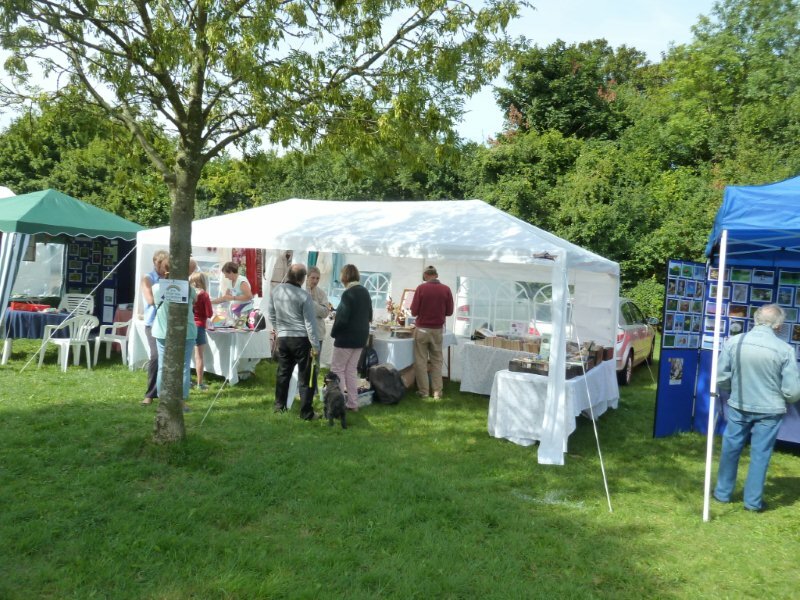 See the gallery below for photographs of many of the stalls. Thanks to Ted Forsyth for these. 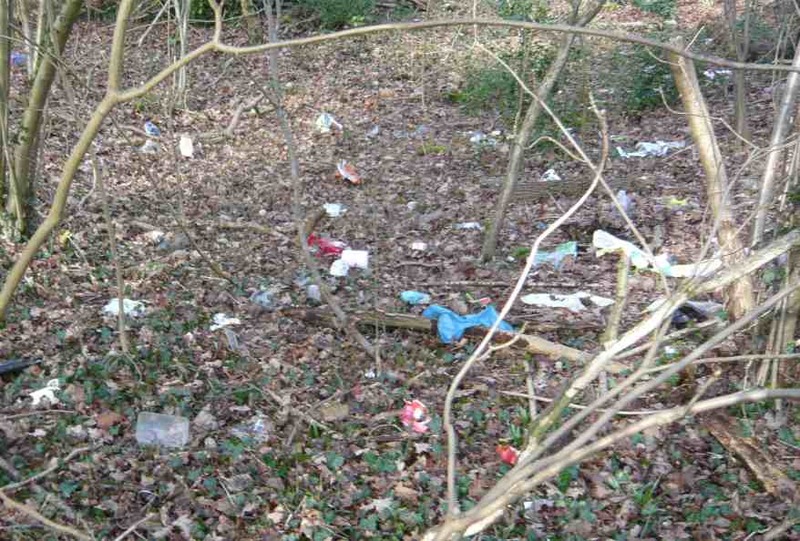 Those of you who live in Courtwood Lane may well have noticed that the stretch of Selsdon Wood running beside the road from Cascades to the end of Markfield is a real magnet for litter - see the “before” photograph top left. The main culprits seem to be those households who persist in putting general rubbish in the street bins and the foxes that pull this into the wood and spread it about the area known as Court Wood. The litter is especially visible at this season of the year when the trees are bare and so this was a perfect time to get in there and clear it up. The FSW organised a community clean up in the area at 10 am on Saturday February 7th. 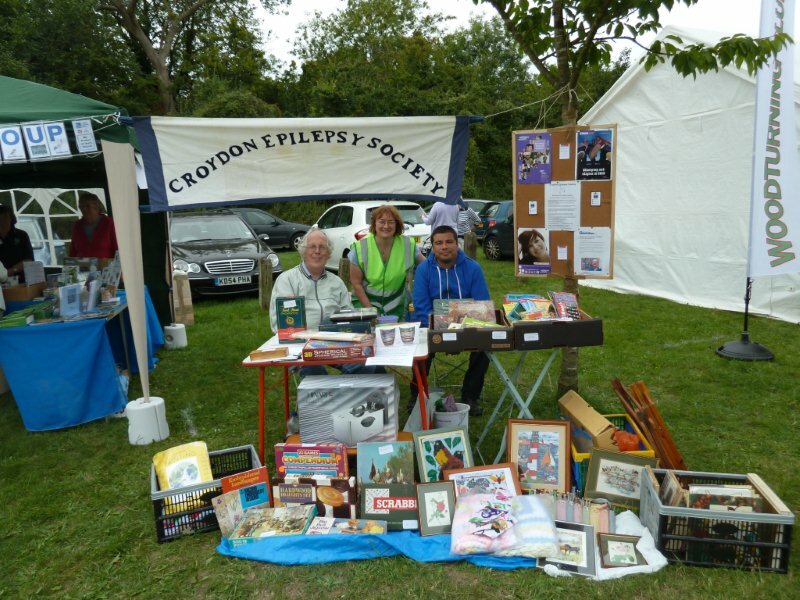 Croydon’s Clean & Green team were eager to support us by supplying posters to advertise the event. News got out via the Forestdale Forward group and we also notified the Head at the nearby Courtwood Primary School. 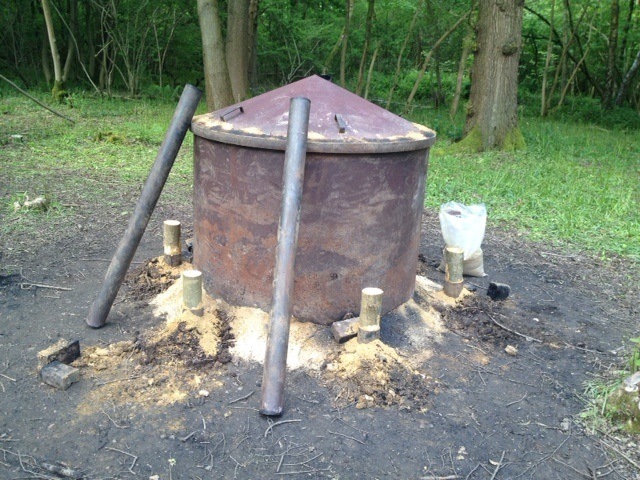 As a result we were approached by several individuals keen to help and also by the leader of the 5th Selsdon & Addington Scout Group and the Pinewood Seahorses Explorer Scouts who offered the support of his young charges working toward their Community Challenge badges. 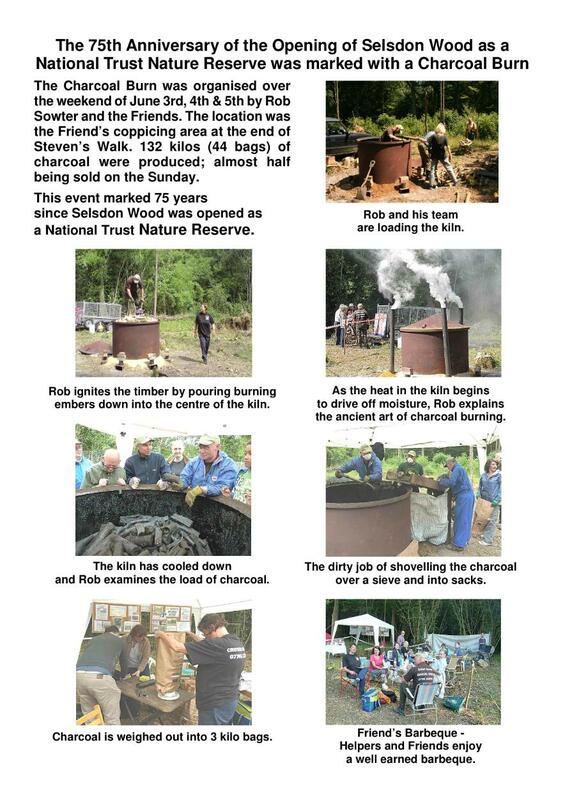 It was a great success - see the “after” photograph top right!! 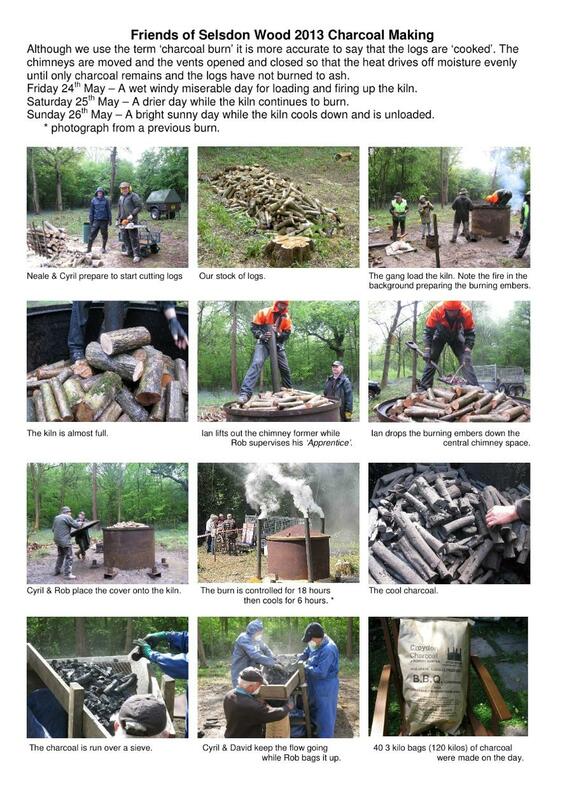 We had around 20 volunteers and managed to clear up Court Wood really well:-) There was an unbelievable amount of litter - see the photograph below showing what we collected. 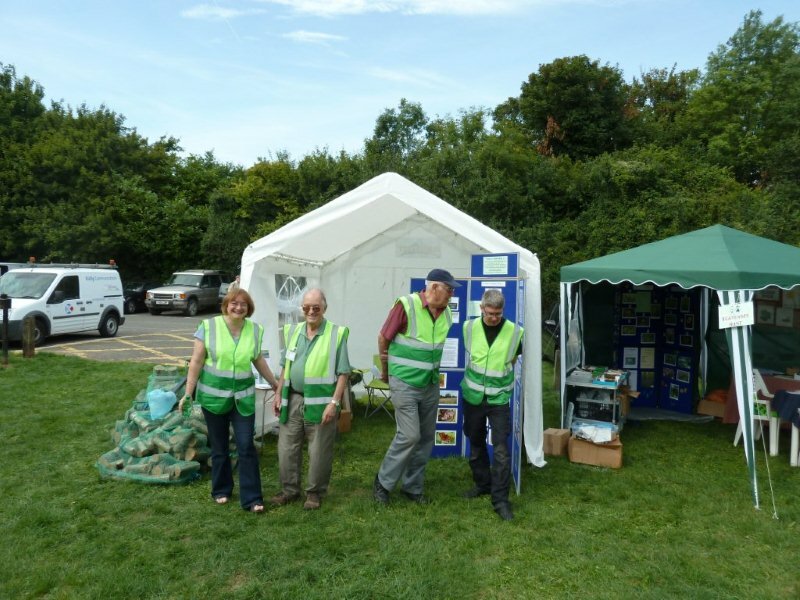 Tracy Bellamy, Croydon’s Clean and Green Street Champion Coordinator, and a squad of Enforcement Officers set up a table with posters and T-shirts and provided litter pickers, gloves, bags and bag holders for the volunteers to use and even T-shirts for all who wanted them. The Enforcement Officers also delivered fliers around the neighborhood with information about the Don’t Mess with Croydon campaign. 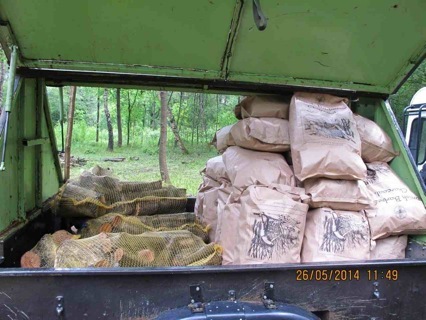 There was a caged vehicle where the collected rubbish could be deposited and we more than half filled it! The event was scheduled for 2 hours but most of the work was completed by 11.30 am when we all got together for the group photograph showing what we had achieved. 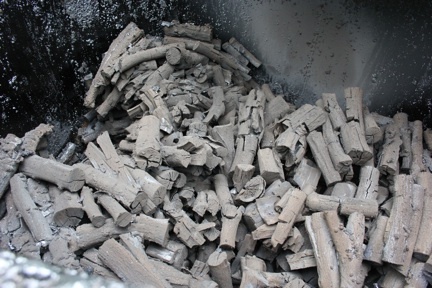 There was a total of half a ton of litter, which was taken away to landfill. Thank you so much to everyone who came to helpJ I have had complementary remarks from many local residents who have noticed our lovely clean woods. 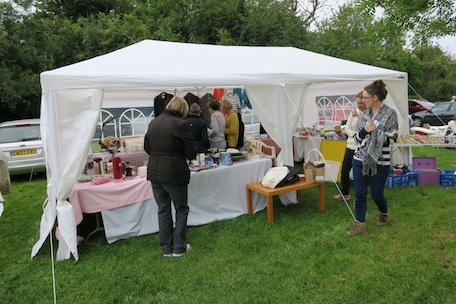 We had a lovely day for our annual fair, which was a fruitful money raiser, netting over £500 (see report below). Photos above from Faheem Mirza, Dawn Gibbons, Mark Shoesmith and Linda Morris. 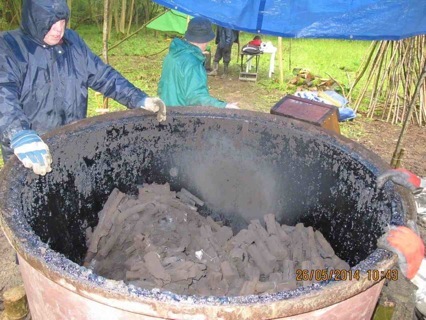 The total sum raised for FSW funds was £525.25 - comprised of: £165 – Tombola; £53 – Brica a Brac; £15 – Charcoal; £4 – Logs; £140 – Calendars; £5.25 – profit on Xmas Cards; £40 - Donations from stall holders; £25 - Other donations; £75 - Membership fees. 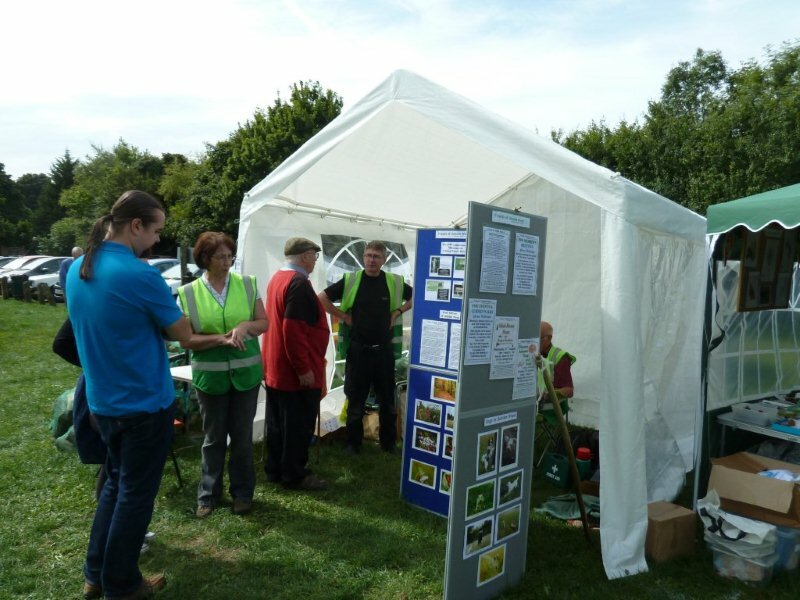 For once the weather for Open Day looked set fair so we looked forward to a successful event. The pitches had all been marked out in advance and a band of Friends and other supporters turned up early in the morning to help get everything set up for a noon start. 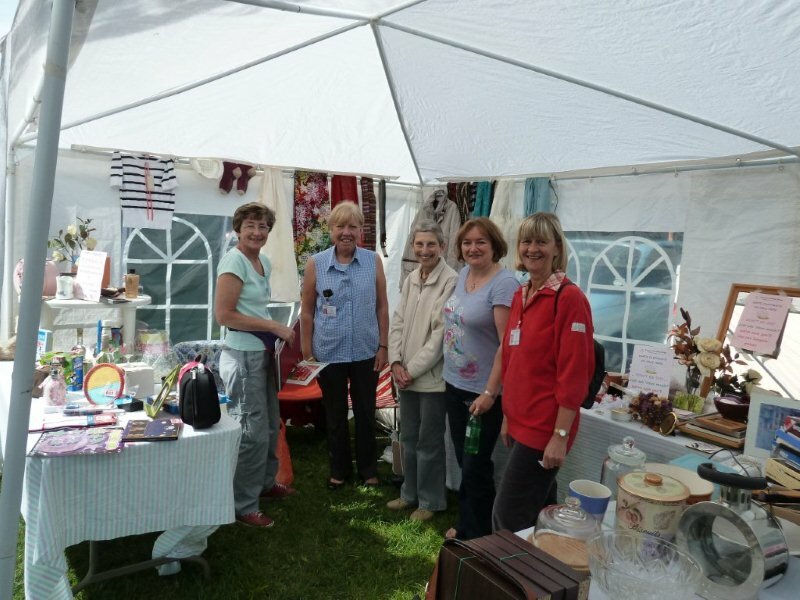 The Friends themselves had four gazebos: one showing what the Friends do in the wood, recruiting membership and making logs available for a donation of £4; a second with displays and activities for children; a third selling tombola tickets, white elephants and books; and a fourth (shared with the Selsdon Residents Association) housing the annual Photo Competition and sales of 2014 FSW Calendars. 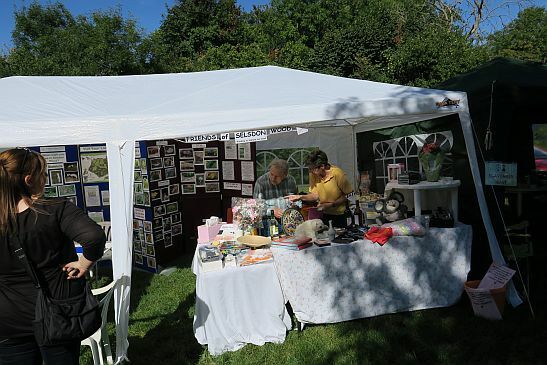 All were kept busy throughout the four hours with over 150 visitors and we welcomed 14 new members and raised a couple of hundred pounds for the work of our organisation. 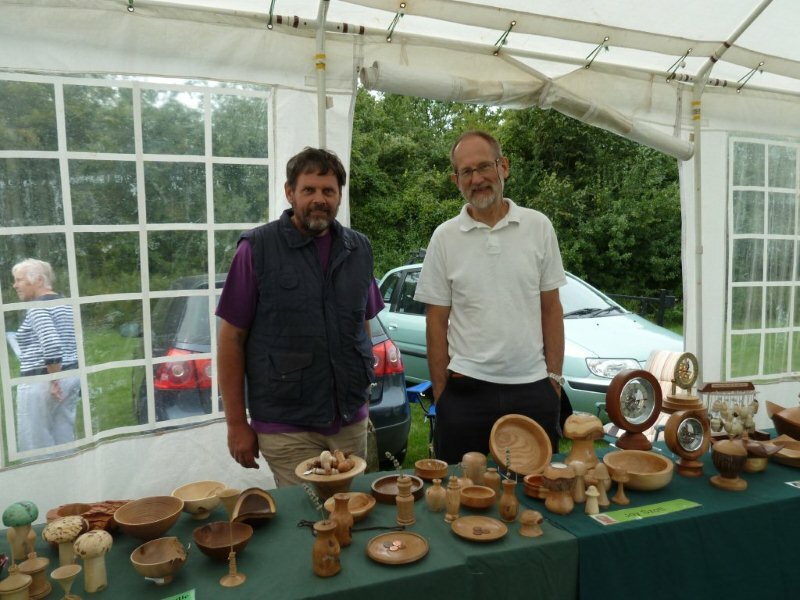 The additional invited stalls covered a wide range of interests and goods – supporting badgers, birds and bees, and selling wood craft and pottery items. 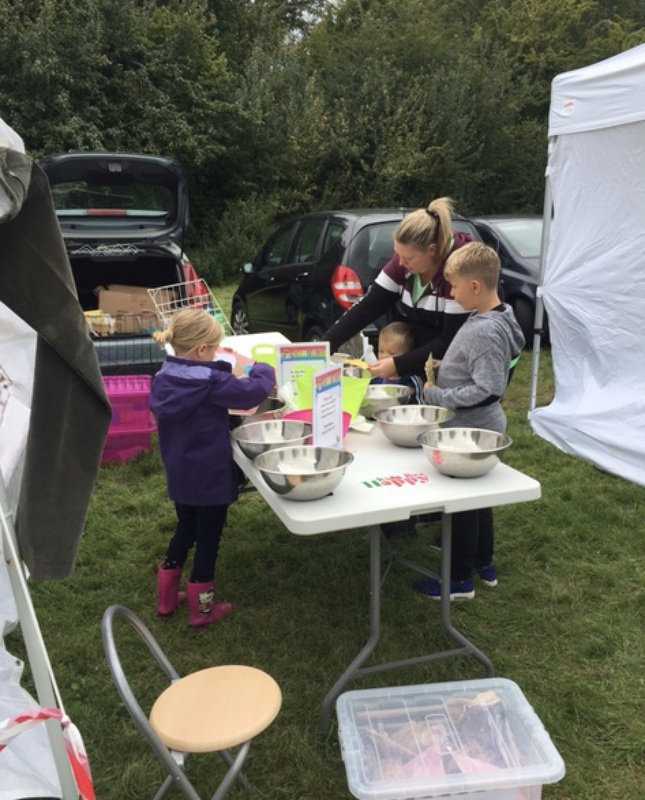 Refreshments were provided by the local scouts and there were guided walks for all ages and activities for children including a scavenger hunt, face painting and story time. Other pages on this website have details of the walks (Walks page) and the Photo Competition (Photo Competition page). 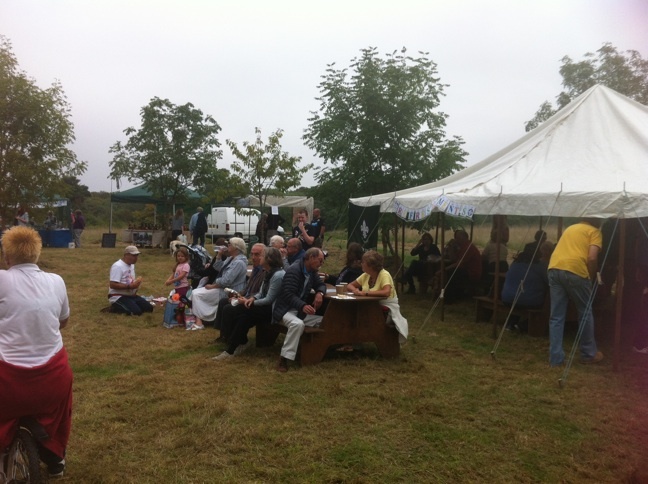 The Friends would like to thank all who helped, especially Linda Morris the event organiser. On 7th August 2013 the Friends installed a new seat which we have donated to commemorate the estblishment of our organisation in 2007. 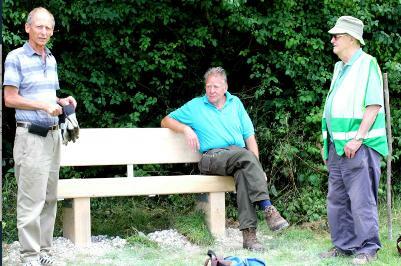 It is at the top of Green Hill (the field beside the car park) and we hope you enjoy sitting there to take in the view.